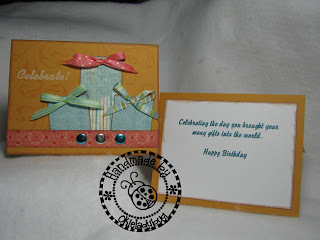 Okieladybug's Scrap N' More: Super Simple Birthday Card! 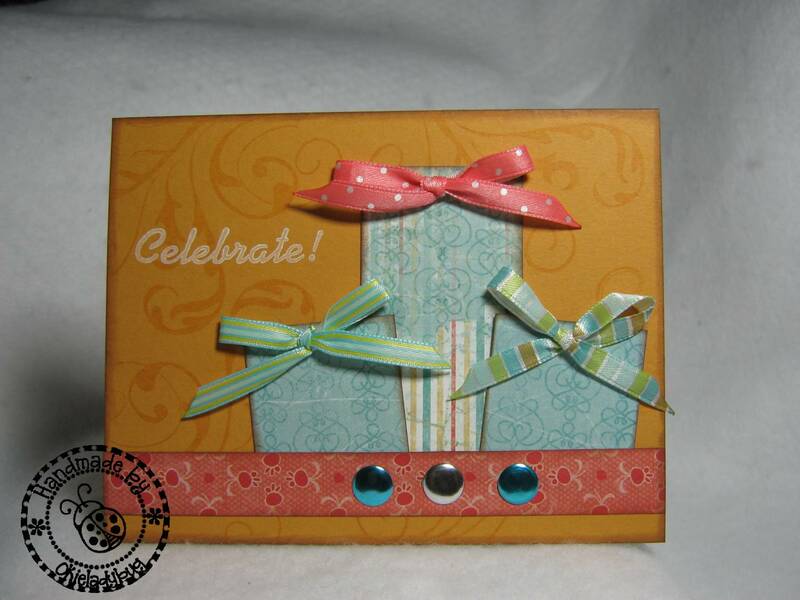 I saw this card layout in my CARDS magazine and thought it would be easy to make. Man was it ever! The best thing is that it can use up your scraps of paper since there is really nothing to the card! You could crank out a lot of these cards quickly and I think you could even use them for guys if you changed the colors *okie has such a hard time with manly cards*. I will probably make some more of these since I am not caring for the colors to well but I just wanted to try it out and grabbed scraps and in person the colors do match a bit better than they are showing in the photo. 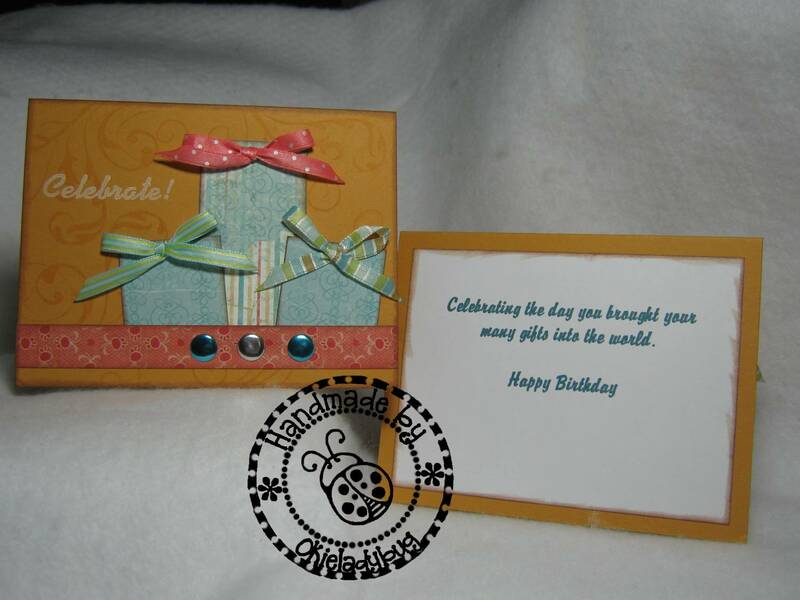 I cut 2 squares at 1.5 x 1.5 inches and then one rectangle by 1.5 x 3 inches for the gifts. I used a hole punch to punch two holes at the top and tie the ribbon through each one. I choose to use a variety of ribbon but you can do what ever. The paper strip at the bottom is cut at 5.5x.75 inches. The sentiment inside was computer generated and I tried to match the font as closely as I could to the stamp on the front. I found the sentiment in a search on the internet and I thought it went well with the front of the card. I did have some difficulty with the ribbon since it was not double sided and I wanted the printed side facing up but I was able to get it done with a little finagling *okie is shocked that finagling is a word and knows it has to be a word because it showed up in her spell checker*. The metal accents at the bottom are some that were picked up at Hobby Lobby, I believe ScrapperDelighted sent them to me. I was thrilled when I realized they were heat set! I used my IRock to attach them to the strip. I don't like plain backgrounds. 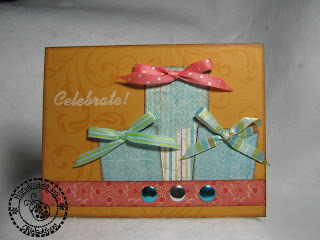 I just can't seem to like a bunch of empty space so I used a Versamark ink pad and a Rhonna Farrer flourish stamp on the card base. 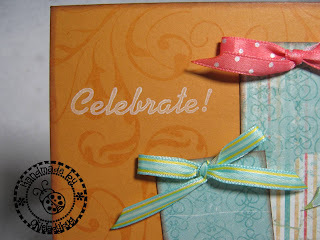 The "Celebrate" is from an Inkadinko cupcake set and I used Stampin Up Whisper White craft ink for that. This is very cute...I think I need to go get me some of the versamark...I already have the dazzle but I am liking the plain better. I'm so happy you crack yourself up; you have a wonderful way to write! You crack me up! PS hope all words are speled right! No spell check on the comment page. I love the layout of this card and the colors are really fab!!!!! I have a hard enough time tying a decent bow using solid gross grain ribbon! This is why I didn't have you order any of the polka dot design from Ribbons & Bows Oh My for me in our last order. I have not figured out how to twist the ribbon so the design shows on both loops. Okay! This post was made on Saturday, it's now Sunday. Where's something new so I won't get bored or run out of things to make???????????? ROFLMAO! So cute!! Those bowed-up presents are such a terrific idea!